A rare example by the famous John Silver, Navajo, who worked for CG Wallace and Asa Glascock and began work in the 1930s. He was an exceptionally excellent silversmith and this is an example of his work during the early Fred Harvey Era. The bracelet contains a gorgeous and somewhat battered-looking piece of turquoise with mica flecks and flashes of green and blue that are quite beautiful. The stamp work is exceptional. 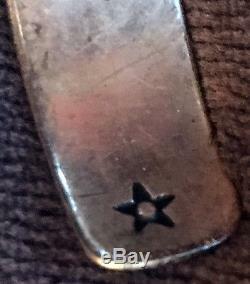 It is signed with a star hallmark that is now thought to be probably that of John Silver, Navajo. This bracelet is 5-1/4" internal length silver alone, with a 1" gap for a total of 6-1/4 total internal length. The width at the center is 3/4" and the turquoise is 3/4" in diameter. The width drops to 3/8 at the terminals. The condition is good vintage, wearable and collectible. The stone has some damage from normal age-related wear, which I believe is probably matrix loss. I personally wouldn't change it. It's a great stone, complex and gorgeous, plain bezel set and framed with hand worked tiny twisted silver. There are appliquéd stamped side panels that are lovely and the stamp work throughout the bracelet is exceptionally high quality and beautiful. It's a great piece! Be sure to add me to your favorites list. Take a look at my store. Yes, I sometimes can take reasonable offers. It's less expensive and is also tracked. First Class International is no longer offered by the US Postal Service. Please let me know if you would like to return something. I care that you're happy and about my accuracy, and will always stand behind my work. When I include pages from published books in my listings it is in accordance with Fair Use Law, which permits the use of source material for discussion, reference, education and criticism. Attributions on many of the old pieces of Native American jewelry are sometimes a moving target. All the books have errors, so in addition to counterchecking, I have developed some expertise over the years and I do care about getting it right, so as more information comes to light I update my listings and also get in touch with my previous buyers, to inform them of any changes in attributions. Everything I sell comes from my personal collection or is something that I would include in my personal collection. I vet every item carefully for quality and condition, and offer you the best. 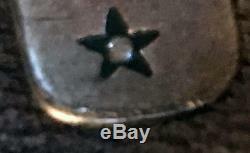 I want you to be able to rely on me for top quality, superb items that are often unique and rare examples of old antique vintage southwest, indian, native american and fine gold and gemstones, whether you're starting a collection or adding to one, or want something great to wear or gift. My goal is that all my buyers are delighted, that my special pieces find the right homes. 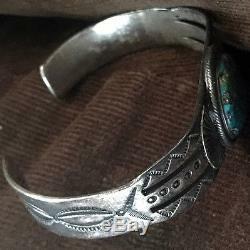 The item "Navajo Signed John Silver Fred Harvey CG Wallace Silversmith Hand Made Bracelet" is in sale since Friday, September 01, 2017. This item is in the category "Collectibles\Cultures & Ethnicities\Native American\ US\1935-Now\Jewelry". The seller is "aaplover" and is located in New York, New York. This item can be shipped worldwide. Internal Length: Silver alone 5-1/4" + Gap 1", total 6-1/4"